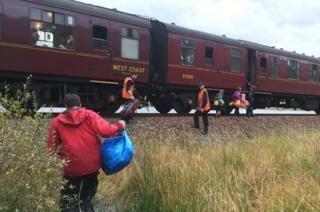 A family stranded in the Scottish Highlands have been rescued by the "Hogwarts Express" steam train. Jon and Helen Cluett and their four young children were staying at a remote bothy in Lochaber when their canoe was swept away by a swollen river. Facing a long walk back to their car across boggy land, they phoned the police for advice. To their delight, they arranged for the steam train used in the Harry Potter films to pick them up. The train, called The Jacobite, is used for excursions on the West Highland Railway Line, crossing the iconic Glenfinnan Viaduct that also features in the movies. The Cluetts and their children - aged six, eight, 10 and 12 - were enjoying a half-term break at the Essan bothy, on the south shore of Loch Eilt. "You can get to it by quite an arduous walk in - or you can paddle for 10 minutes in a canoe across the loch from the road. We had a canoe so we paddled across the loch to the bothy," explained Mr Cluett. "We were all in the bothy, warm and fed - all was good - but we'd moored the boat in a little burn behind the bothy, tied it to a wall, pulled high out of the water. My daughter woke up yesterday and says 'Daddy, Daddy - the stream is massive'. "The burn was overflowing. The entire area was underwater. The rocks I'd tied the boat to were pulled apart and the boat was gone." The family weighed up their options for getting back to their car. A three-mile walk with small children across difficult boggy ground or along the nearby railway line were discounted as impractical or too dangerous. "In the end I decided the only option was to phone the police and mountain rescue, ask if they have any local knowledge that could help us out," said Mr Cluett. The police came back with a magical solution. They arranged for the next train on the railway line that runs close to the bothy to make an unscheduled stop. "The amazing thing was it wasn't just any train. The next train that was passing was the Jacobite steam train - the Harry Potter, Hogwarts Express steam train that goes up and down that line." The family hurriedly packed up their belongings and made their way to the line, about 400 metres way. "We threw all our stuff into some bags and boxes and ran out of the door of the bothy at the same time as the train is coming around the tracks,' said Mr Cluett. "The train is getting closer, we're running down, stuff bouncing everywhere, big smiles on the kids faces. It all started to be fun at that point. The family were dropped off at the next stop, at Lochailort, from where Mr Cluett was able to hitch a lift to retrieve his car. He reflected: "The kids have certainly had an adventure. We've all had an adventure - a big thanks to everyone who helped us." His only regret is that his canoe has still not turned up - although he remains hopeful someone will find it. "I think it will still be bobbing around in the loch somewhere. A big red canoe - so if you see it, that would be helpful. That would make the last part of the story even better."